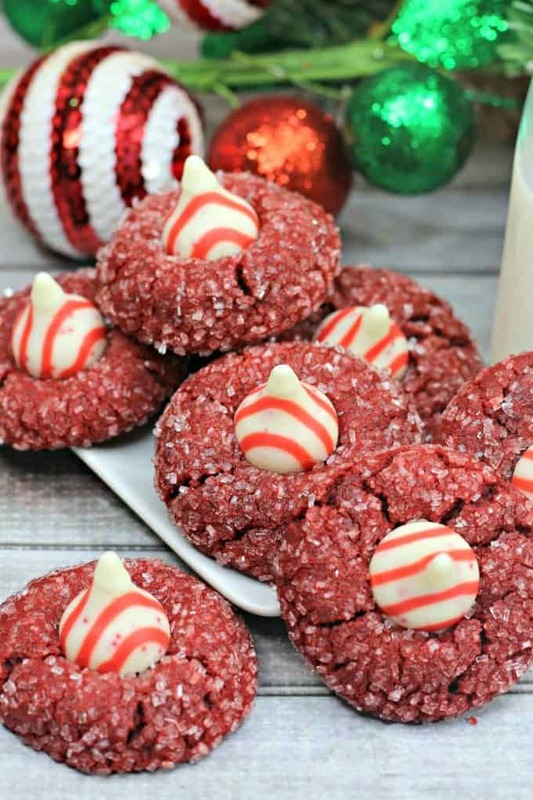 Peanut Butter Blossom Cookies are a classic tried and true recipe, but add some red food coloring and a Peppermint Bark Hershey Kiss and you have a new Christmas Cookie to share at your cookie exchange! We love Christmas Desserts and some of our favorites are our Chocolate Filled Monkey Bread, Chex Mix Christmas Crack and our Peppermint Oreo Popcorn Bark. Peanut butter and chocolate just belong together! These Peanut Butter Blossom Cookies are a family favorite and a holiday classic cookie that is perfect for any time of the year! They truly are the perfect Christmas cookie (or for that matter, perfect cookie for any time of the year!) They are easy to make, fun to make with kids and delicious! They are a Christmas dessert staple. That’s why you will always find it at your cookie exchange! However, this version shakes things up a bit! 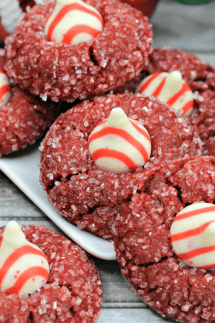 Just by adding a little red food coloring and a Hershey’s Peppermint Bark Kiss, it brings on a whole new peanut butter blossom cookie dimension and we love it! The traditional blossom cookie recipe uses a plain Hershey Kiss, which you can totally do with this recipe too! But, we love the added hint of peppermint to really “holiday” things up. There are so many different varieties of Hershey Kisses these days, I would encourage you to try some and get creative. We also love the Hershey Hugs and the Hershey Kisses with Caramels. I would love to try the Hershey Kisses with almonds next time. I think that would be really yummy! Need peanut free blossom cookies or just don’t like peanut butter? We have a wonderful Sugar Cookie Blossom Cookie version too that we absolutely adore! Check out our BEST CHRISTMAS COOKIES ON PINTEREST round-up! 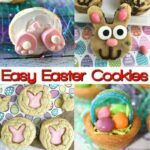 I think part of the popularity of blossom cookies is because they are so easy to make and there are so many little tweaks you can make to personalize them! To make these cookies, you are going to combine all of the ingredients (see recipe card for details below) and scoop them up and roll them into balls. Tip: If your dough is too sticky to roll, just put it in the refrigerator for about 20-30 minutes. This will help firm it up and take some of that stickiness away! 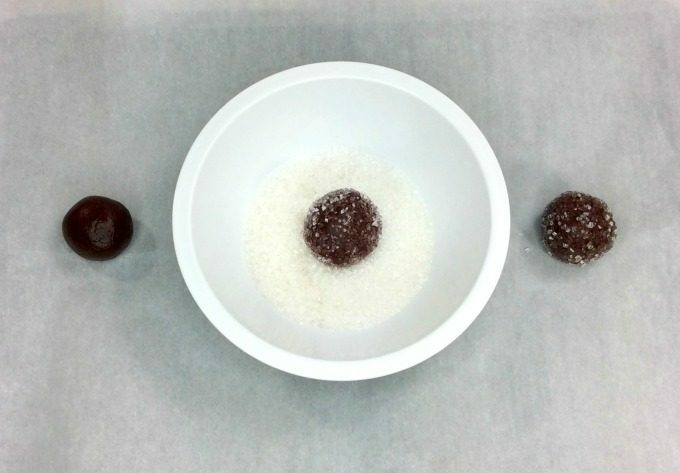 After you roll them into a ball, we like to roll them in some white sprinkles or you can even use granulated sugar. Then place them on a cookie sheet (about 2 inches apart) and bake them for about 8-10 minutes. Once the cookies are baked, let them cool for just a few minutes. You want them soft enough that you can put the Hershey Kiss in the center of the cookie, but not too hot that it will melt it! If you find that they are melting to much, you can quickly put the cookies in the refrigerator or freezer right after you put the Kisses on them. (just for a few minutes to set them). Even if they melt a little, they will firm up pretty quickly! Two staples for my house when making cookies (affiliate links) are my cookie scoop and my silicone baking mats. These are two things I cannot do without! Preheat oven to 350 degrees and line a baking sheet with parchment paper or silicone baking mat. With the mixer on low and beat in egg, milk, vanilla, and red food coloring. In a separate bowl combine the cocoa, flour, baking soda and salt. Gradually add flour mixture to sugar mixture and beat until just combined. Pour the white sprinkles into a bowl. Roll dough ball in sprinkles and place on prepared cookie sheet about 2 inches apart. While the cookies are baking unwrap the Hershey's Kisses. Once cookies are done baking, remove from oven and let cool for just a few minutes. Press a chocolate Kiss into the center of each cookie. If the Hershey Kisses start melting too much after you put them on the cookies, place them in the refrigerator or freezer for a quick few minutes to help them set faster! I love how festive these are! Peppermint is such a delicious flavor! Love these! These are so fun and festive! The true test will be trying not to eat all of the hershey kisses between each batch, haha! These are my favourite cookies! What is not to love when it comes to chocolate and peanut butter….right! So fun and festive, I love it! Thanks SO MUCH!! Happy Holidays! I love that you’ve made these so much more festive with the red color! 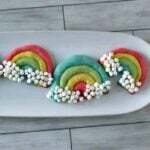 Ive got all of the ingredients on my counter to make these tomorrow with my niece! WOOT WOOT! Let me know how they come out! I know what I’m bringing to the Christmas Cookie exchange this year! You will be the hit of the party!